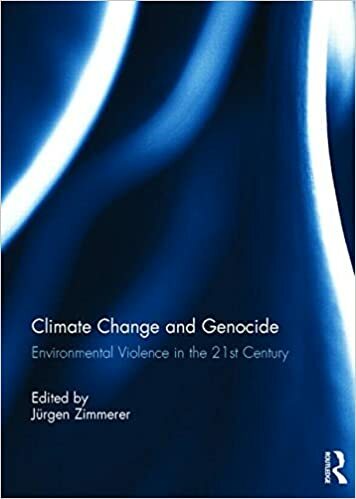 Book Review: Climate Change and Genocide: Environmental Violence in the 21st Century, edited and with an introduction by Jurgen Zimmerer (Routledge, 2015). A remarkable confluence of events is refocusing our attention to the connection between violence and the environment. From the environmental precursors to the Arab Spring, to the worsening conflicts in Equatorial Africa and Nigeria, to the string of damaging tropical cyclones, to the United Nations Climate Change Conference in Paris, politicians and the press are talking about “the planet” again. A new book presents a typology of environmental violence in our century, helping us make sense of social and ecological destruction. The environment is often a subject of economic, political, and charitable discourse. In recent years, ecological crimes have inspired appeals for a national or global order in which environmental violence could be prevented. Climate Change and Genocide: Environmental Violence in the 21st Century brings together work in social theory, human rights, development, and security to explore “decentered” genocide as globalization and increasing inequality result in ecocide, and less commonly, in decisions for mass violence by traditional means. Ecocide occurred prior to the concept being used in our discourse. In addition to the environmental damage caused by the world wars and the Cold War, the Biafran war of independence was resolved through the use of starvation as a weapon of war, which killed millions of Biafran Ibos in a few years’ time (pp. 44, 95). More recently, jurists debated whether nuclear weapons could be used without committing genocide against a nation or humanity, and whether climate change may have triggered a genocide in Darfur, Sudan (pp. 117–119). The concept of ecocide is difficult to define. In the 1970s, bioethicist Arthur Galston referred to it as the intentional destruction of a specific natural environment, which is quite broad (p. 45). In another formulation, he required the permanent destruction of an inhabited environment. Intent is a major theme of this book, but unfortunately the work of international tribunals defining it in genocide cases is not covered. A report for the United Nations in 1985 proposed narrowing the scope of ecocide to acts such as severe pollution “which threaten the existence of entire populations . . . .” The Rome Statute of the International Criminal Court excluded the crime of ecocide from its ambit, after the United States criticized a 1993 draft code of international crimes as being too vague on the environmental front. Still, the Rome Statute included a war crime of knowing attacks on the national environment causing “widespread, long-term and severe damage” to it (as well as the willful causation of serious injury to human health). There are other broader definitions, such as one proposed by Martin Shaw. Jurists and diplomats have stymied the prevention of ecocide. The United Nations Charter vested too much power in the Security Council and did not create a robust World Court where equatorial states, small islands, communities suffering severe environmental damage in war, and other victims of ecocide could obtain compensation for the wrongs done to them, or orders to desist. The Genocide Convention called for an optional international criminal court, making it difficult to sanction genocide as defined in article II(c) as deliberately inflicting upon a group conditions of life calculated to bring about its partial destruction. The U.S. Supreme Court has declined to recognize that the “law of nations” was a category seen by the Framers and contemporary jurists as evolving, and has imposed a nearly impassable bar of lengthy and near-universal acceptance of new norms in suits by aliens. The U.S. courts have announced rules of “comity” and specific intent that leave gaps in international environmental law. The international human rights treaties do not have useful enforcement procedures, as the European Convention on Human Rights does. The International Criminal Court has not prioritized destruction of indigenous peoples’ lifeworlds. The diplomats who articulated the “Responsibility to Protect” populations from crimes against humanity deliberately left out severe environmental destruction in order to avoid being too controversial. This is perverse because it makes a norm designed to protect “populations” applicable to some tragedies affecting one or a few individuals (outrages against prisoners of war, for example, are covered war crimes) but inapplicable to destructive actions that may kill or impoverish millions of people. The Intergovernmental Panel on Climate Change’s assessment reports project that millions of people, particularly in Africa, will lose access to food, water, and/or housing due to droughts, desertification, flooding, and storm surge (pp. 64, 68). Droughts and like events may displace 50 million people and rising seas about 160 million people, by 2050. Related malnutrition may confront 200 million people and their families (p. 68). Of the countries that data from 2009–2011 placed at risk of genocide according to one study (p. 97), some are already in shambles, like the Central African Republic. The existence of groups is being threatened, knowingly if not purposefully. There are good reasons to be cautious in punishing environmental damage. The factors that may drive climate change—industrialization, fossil fuel consumption, and globalization—also contributed to declines in poverty and increases in the world’s human population that are incredible by nineteenth-century standards. Most people who contribute to environmental degradation do so without the intent to harm others, and usually with the intent to benefit consumers. Many alarming forecasts of environmental catastrophe in the past did not pan out, and schemes like emissions targets and carbon trading may be boondoggles. This book, however, helps us rethink the law of transnational damage, and the intent/structure divide in philosophy, jurisprudence, and legal diplomacy. There are more informative works out there on the international law of environmental damage, the moment of habitat-destruction in genocide, and the extent of environmental and health impacts caused by communism, globalization, and the wars in Southeast Asia, Biafra, Ethiopia, Yugoslavia, Iraq, and Sudan. Yet there are few volumes so thought-provoking in surveying social theory, recent history, climate science, and security studies. Ramesh Thakur, The Responsibility to Protect and the North-South Divide, in International Law: Contemporary Issues and Future Developments 38–39 (Sanford R. Silverburg ed., Westview Press, 2011).